michelle paige blogs: Nerf Gun Party! 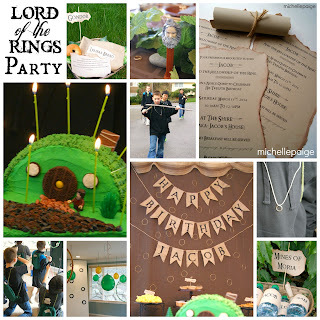 Some of you have been waiting to see my son's party from last week-end! I showed the cake on my Facebook page, but that was it. 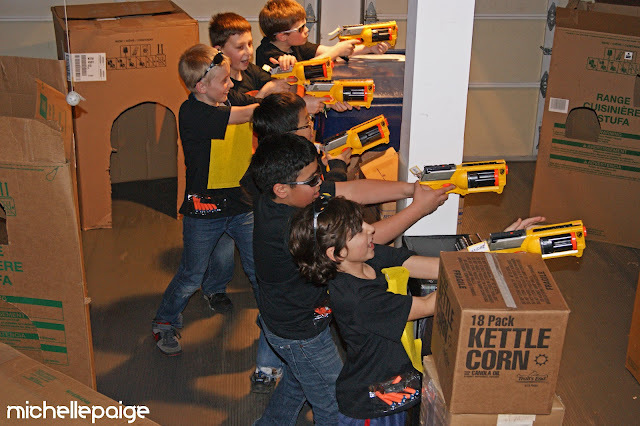 Here it is...A NERF GUN PARTY! NERF gun was drawn by my son. Arrival and Assemble Gear was first. My 10 year old really wanted the shooting to be fair. 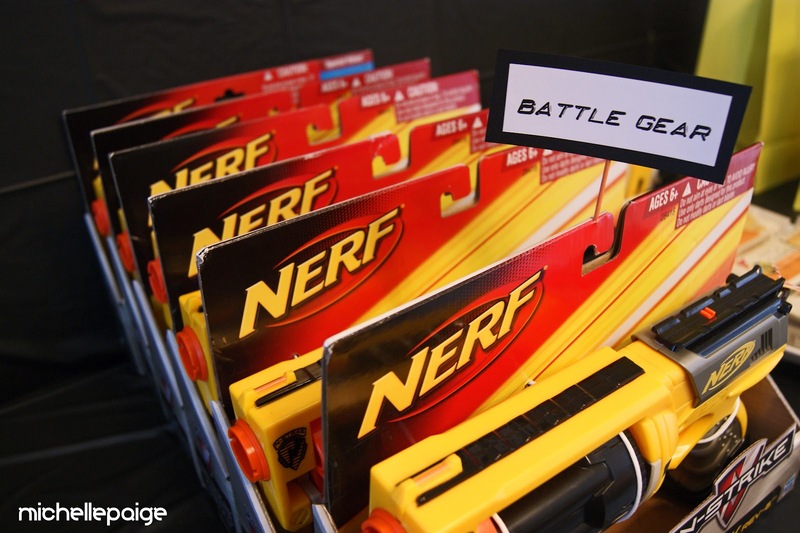 In order to have fairness, everyone needed the exact same NERF gun. Luckily, I knew the party theme way back in November when Fred Meyer had their Black Friday Sale. I was able to get these guns for a steal and tuck them away. Here's a similar gun to the one we used. Click here. I also bought lots of extra foam darts on sale! Update: NERF now carries these amazing laser NERF guns that add up points. They are sold in a set and a bit pricey, but very fun! 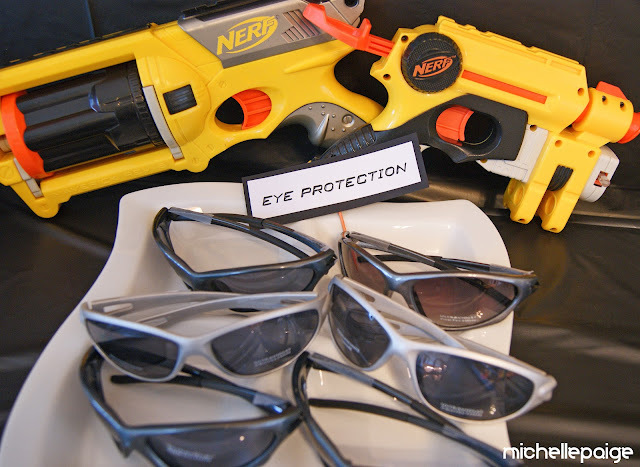 Eye protection is a must with NERF guns. These are Dollar Store sunglasses. They worked perfectly and only $1.a piece. If you don't have a Dollar Store nearby, these safety glasses are another affordable option and these glasses are even 'cooler' looking! Of course my kid wanted NERF Elite Tactical Vests. I was NOT going to buy vests for everyone, so I made my own version. I used $2. black T-shirts and got out my sewing machine. I sewed Velcro onto each shirt and the matching Velcro onto a piece of stiffened felt. 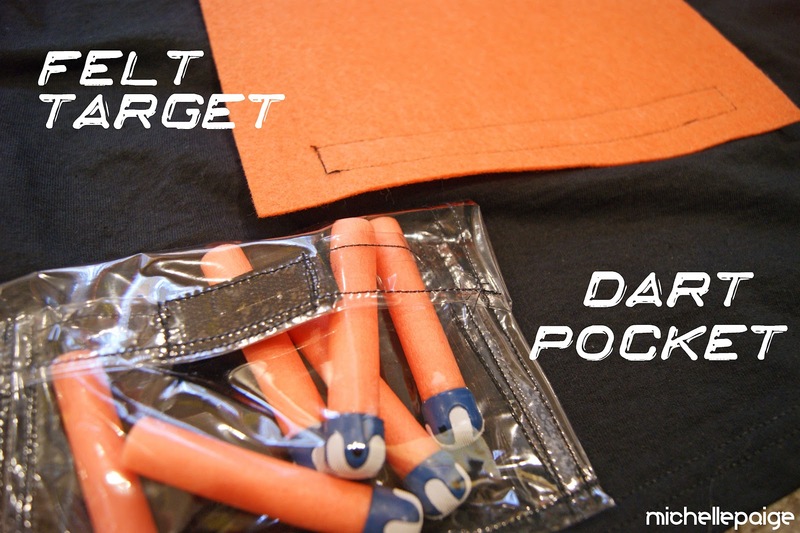 Using a thin plastic material, I sewed up a pocket with a Velcro closure, to hold the extra darts. Team Orange or Team Yellow. 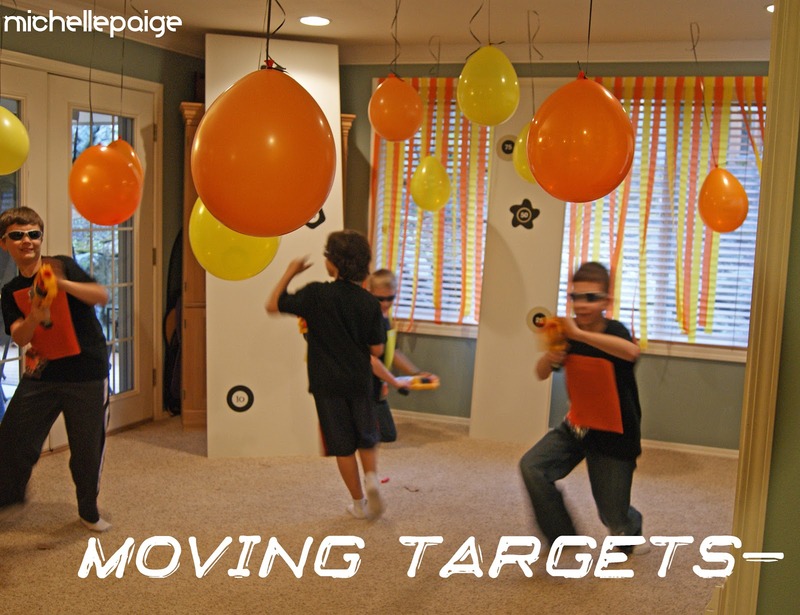 and let the boys try out their guns by shooting the balloons (moving targets). (from this LEGO Organization project) that were perfect for the suction darts to stick to! I made vinyl targets with number stickers and stuck them onto the boards. Here's another option for stick on targets. Our playroom looked like the Disneyland Toy Story ride! One by one they fired off their guns using the suction darts. 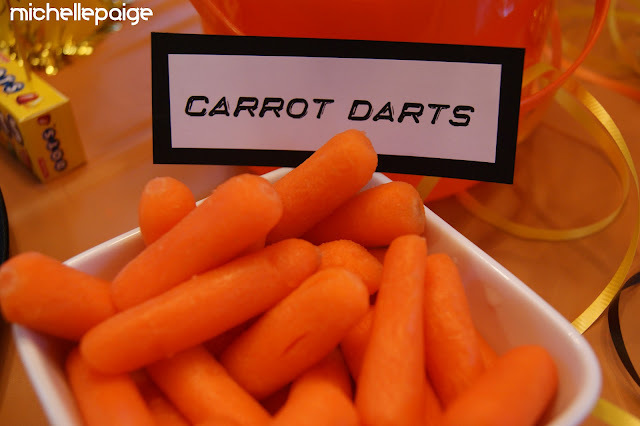 The darts stuck easily to the laminate boards. We also practiced many Undercover Moves. -Rolling and shooting target on knees. -Peeking around the wall and shooting target. -Running and shooting target with no stopping. at each kid while they tried to dodge the bullets. This was quite the sight to see! The Duck and Cover Drill involved moving out to the garage. We gathered lots of cardboard boxes and set up a battle zone. The kids practiced ducking behind the boxes and shooting at the wall targets. After all those drills, it was finally time for Dinner! Here's a look at some of the food. And don't forget about the cake! 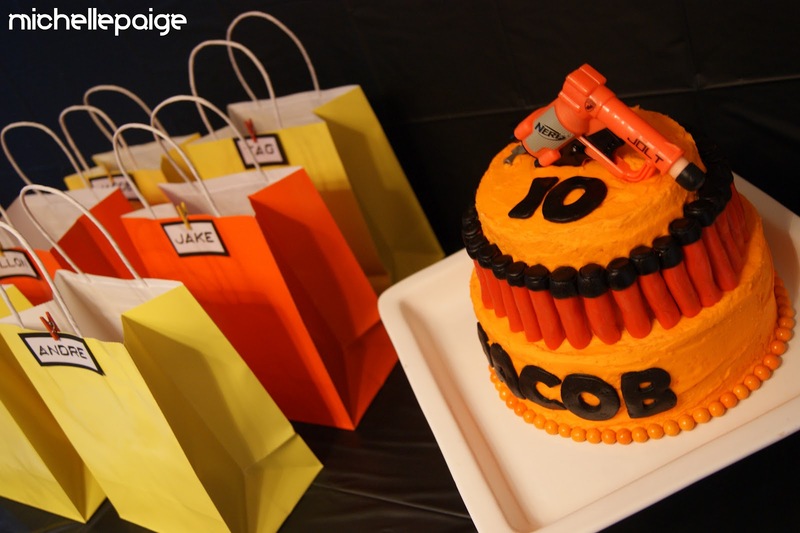 The orange darts and letters are made with marshmallow fondant. I hand rolled each one! The gun on top is a mini NERF gun. One boy said to my son, "I don't really like cake, but I love my mom's cake and your mom's cake." but were basically an empty bag for the kids to carry home their guns, darts and glasses in. What you don't see in this picture is how sweaty my kid is. The boys played so hard that they were dripping with sweat! Quick Instructions: Place lollipop stick into large marshmallows. Dip marshmallows into melted colored Candy Melts. Do one color all the way to the top, then let dry. Once dry, dip into 2nd color. 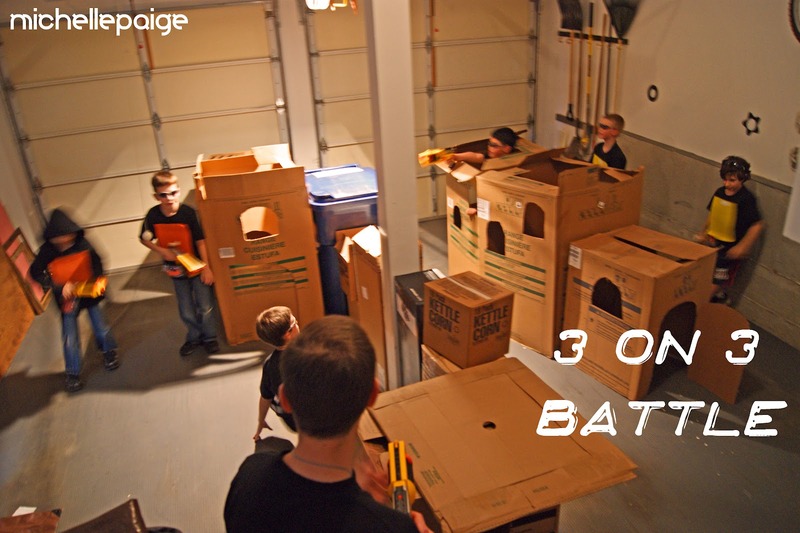 And finally it was time for the 3 on 3 Nerf Gun Battle. Back out into the garage they went. Team Orange took one side of the garage. Team Yellow took the other side. Oh, what great fun they had! They (we) were so exhausted! Whew! How could you possibly be that old? I love you, kid. To see our ARMY PARTY click here. Instagram or Twitter at mymichellepaige. 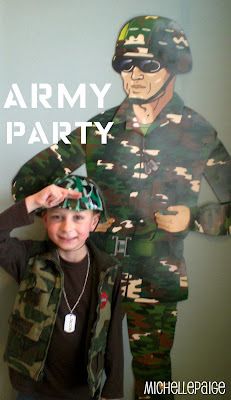 To see the entire collection of parties A to Z on my site, click here. And come visit my Springtime Holiday Link Party! Michelle...that is an amazing party! What a fun mom you are! This party looks so fun! Amazing! 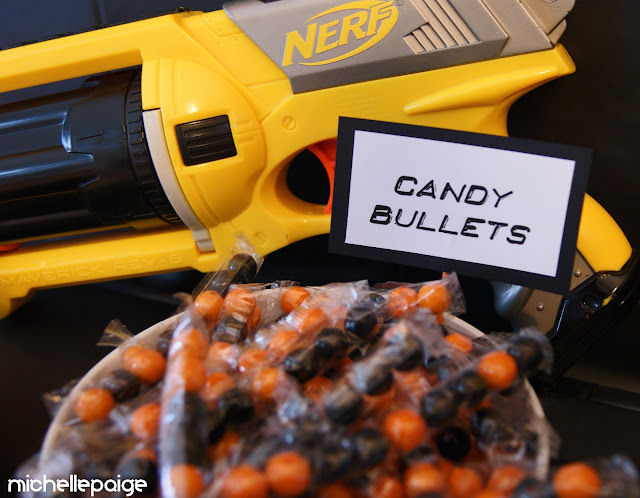 I am going to pin in and plan ahead for Nerf sales! Fun party!! You did an amazing job! PS I live four hours south of Seattle in the Willamette Valley of Oregon, it is March 19th and this morning we woke up to s-n-o-w!!! Wow, what a fun party I am sure they all had such a blast. The cake turned out perfectly and I love all your details. Turned out awesome, as always. Something to keep in mind for Jonathan in a few years, especially the part about buying the guns on black Friday or at least during the Christmas craziness when they are on sale. Good plan!Now I'm going to check out your spring party as I need something for my front door. Hey Michelle! Thanks for visiting P3! It's always a pleasure to "meet" another Pacific Northwesterner. This is so cool. My son, 9, has had a nerf war party for three years in a row. The first two years we had at our home. This last October we went to a nearby park that had tons of trees and had a "Capture the Flag" Nerf war. It was awesome! The boys had the best time and didn't want to leave. 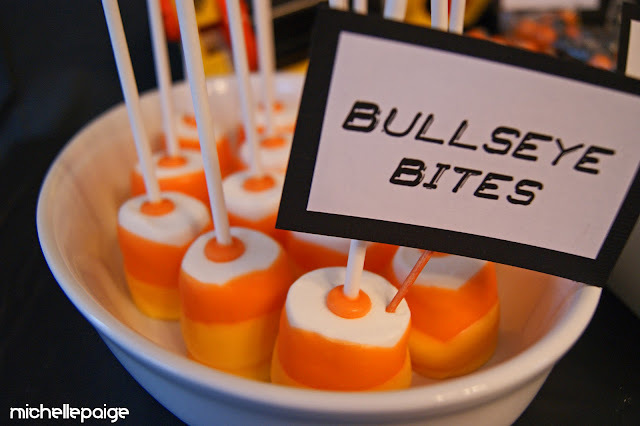 You really went all out with the themed treats and everything. I'm loving what you did!!! My son's birthday is October 29th...the Halloween colors would have been perfect. My son would have flipped-out for that party! You get mom of the year for that. Dang! It was AWESOME. So dang cool!!!! Seriously ...the best homemade birthday party for a 10 year old I have ever seen. My youngest is turning ten in August! I love this idea. Way to go! 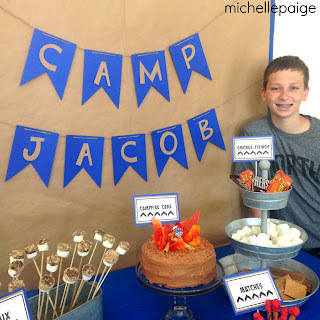 Thanks so much for linking up at my party over at TheWinthropChronicles. 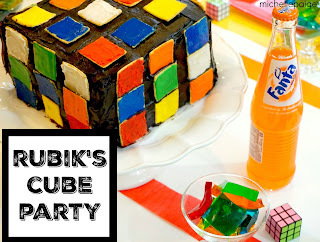 You always have such cute party ideas I love it! Michelle . . . This party ROCKS!!! 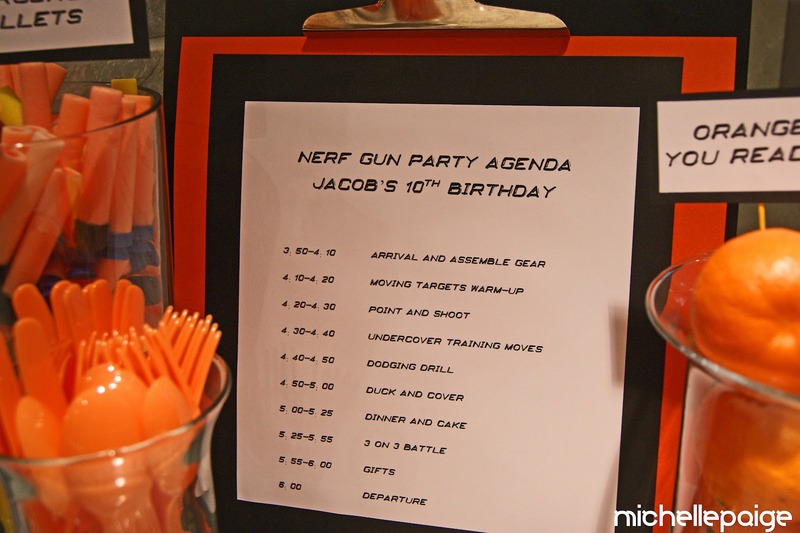 My son would love a Nerf party! I am keeping this party bookmarked. You put this party over the top! Way to go!! Keep up the good work! You did a great job with this--love the theme and all your work! Wow, this is spectacular! I've never seen anything like it - great job!! This is seriously THE COOLEST! 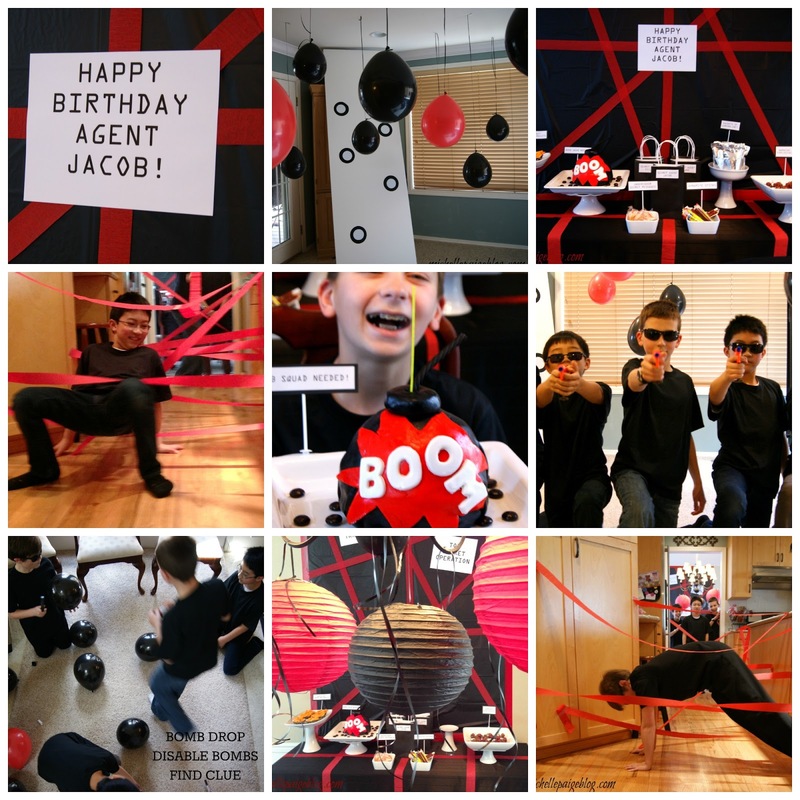 I'm now slightly jealous of a 10 year old for getting to have such an awesome party. I've now made myself believe that this would be an awesome party for adult too! Wow, I have three boys, and they would have loved it! I wish I had seen this about ten years ago. My oldest is going to have a baby in August, so I am going to be a grandma. If it is a boy, now I've got an excellent party idea. Very creative! Thanks for sharing. I love all the details! Looks like so much fun! Haha! Looks like so much fun! Thanks for sharing at Things I've Done Thursday! I just googled Nerf gun cake images and your pic showed up. I'm going to be a copy-cat and use some of your ideas. My son is turning 8 in April so thanks! You are officially the boy party guru! So cool, fun, and perfect! 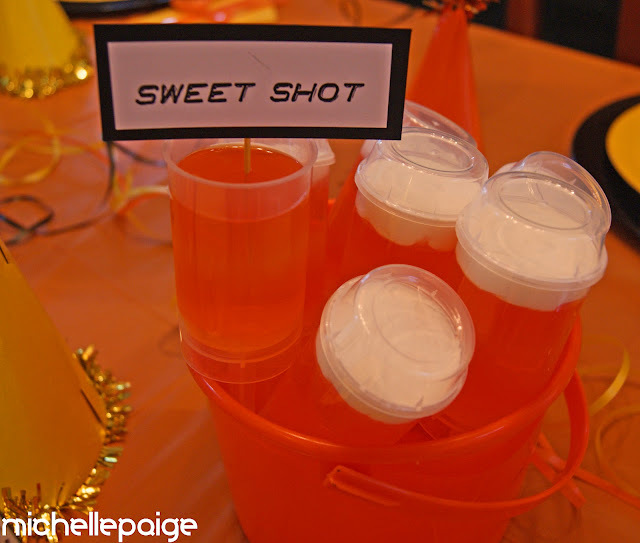 We really appreciate you sharing this at our link party and can't wait to see what you are up to next week! Oh my gosh, I bet your party was a HUGE hit with the birthday boy and all his friends. You are so clever to be thinking that far ahead so you could save money and give the kids the ultimate take home goodies from the party. Love, love, love it and it's so nice to see a super cool party for boys, although I know lots of little girls would have fun too, that's not for little babies. Thank you for sharing on A Crafty Soiree. I'm featuring your party in the newest one. Please come check out your feature when you get a chance! wow -what a great idea, thanks! I have been planning a Nerf party since November, yours is the best one I have seen! 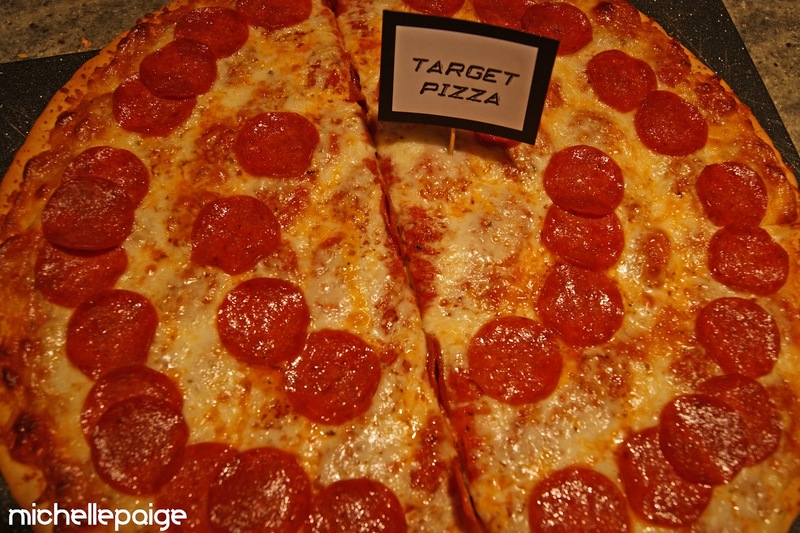 Love the party games you came up with and the awesome target pizza! What a great job you did! I'd love to know how well the Nerf Guns held up. 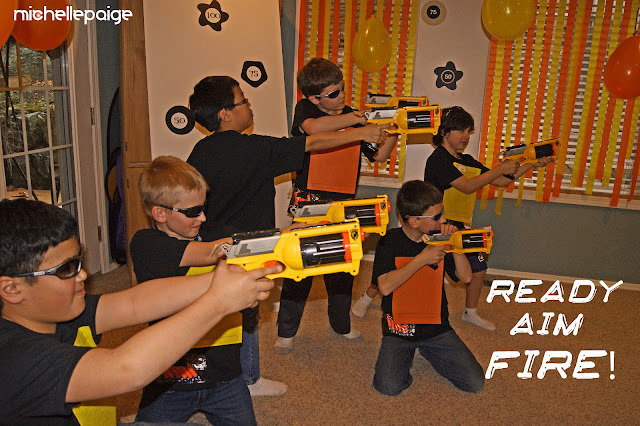 We just bought 15 NERF dart tag Speedload 6 Blasters in preparation for my son's 8th birthday. In testing them out they are jamming and the thought of 15 boys running around with defunct guns is not sitting well with me. I'm curious how the guns you used worked out. Loved the Ideas!!!!! !So Created!!! Love it!!! Congrats on a successful party. OMG - this is an amazing idea! 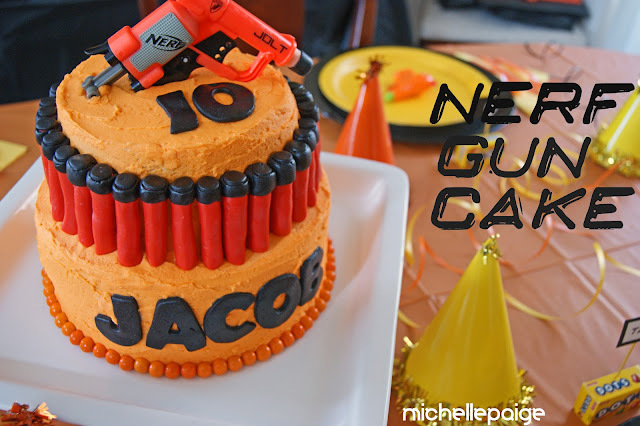 My son has been telling me that he wants to have a Nerf birthday party this year and I was really wondering how to pull it off. Thank you for some truly amazing ideas!! PS - I LOVE how you made the vests out of t-shirts!! Awesome idea!!! Great idea. We went to a paintball birthday party last week and then yesterday it was a kids reptile party so we've had a good run with themes at children's parties. Cost is a lot, but they do make them far more interesting. What an great party! I want to do this for my 40th! Absolutely amazing! 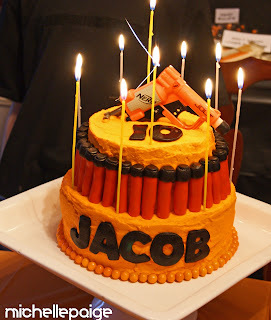 This is the perfect inspiration for my soon-to-be 7-year old son's birthday. What a blessing to come across your son's party just after seeing my little boy cry when we found out he is too young to paintball. He is now thrilled about having a nerf battle. Thank you for sharing! 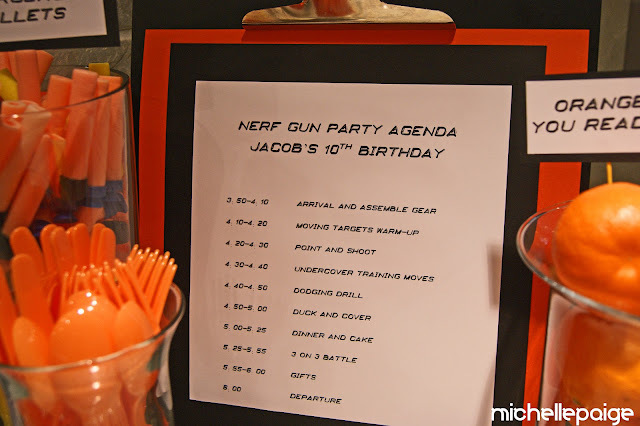 What a fabulous party...every little boy's dream Nerf gun party. My son is planning his right now and I loved the way you did the invitations. Would you share what font you used on them? Thanks so much! This is one exhilarating birthday party, Michelle! I think it’s so sweet that you really took the time to setup and organize everything for the party. 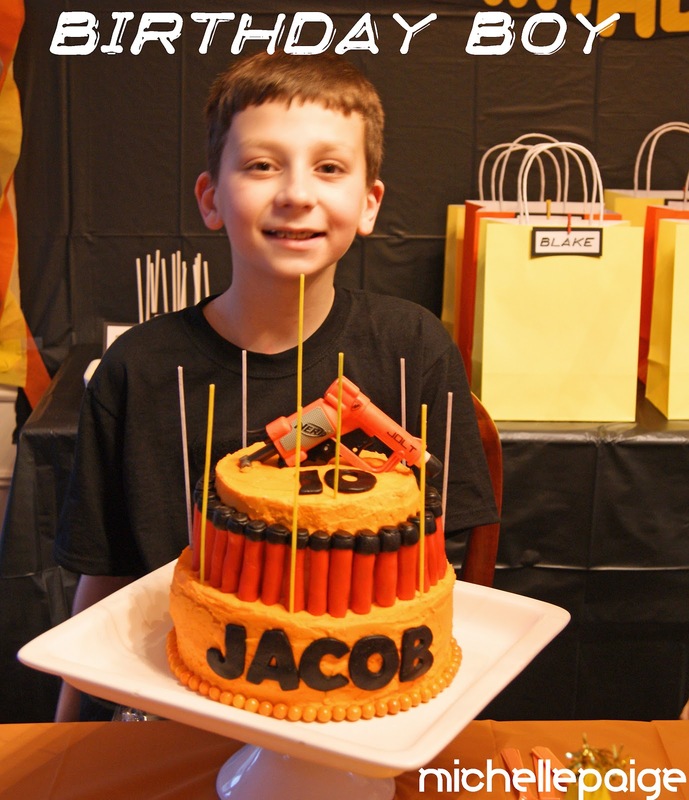 The cake and the pizza were also pertinent with the theme, and you even made t-shirts for the kids to make them feel and look superior. Only for your little boy, eh? Well, I am sure that your little lad enjoyed his 10th birthday so much. 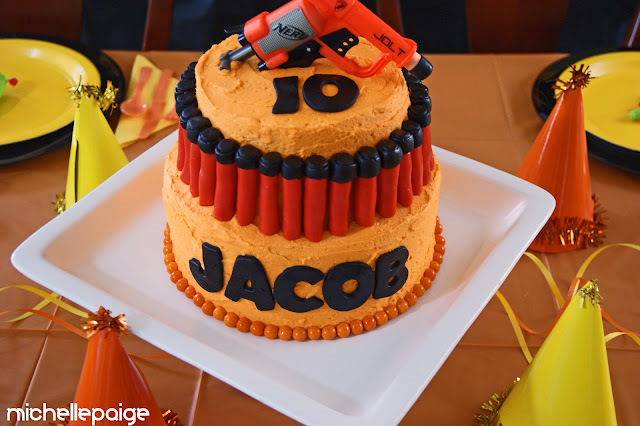 The perfect party for my 9-year-old Oct 20th! Thanks for doing all the work for me!!! He's going to love it! That party looked great. 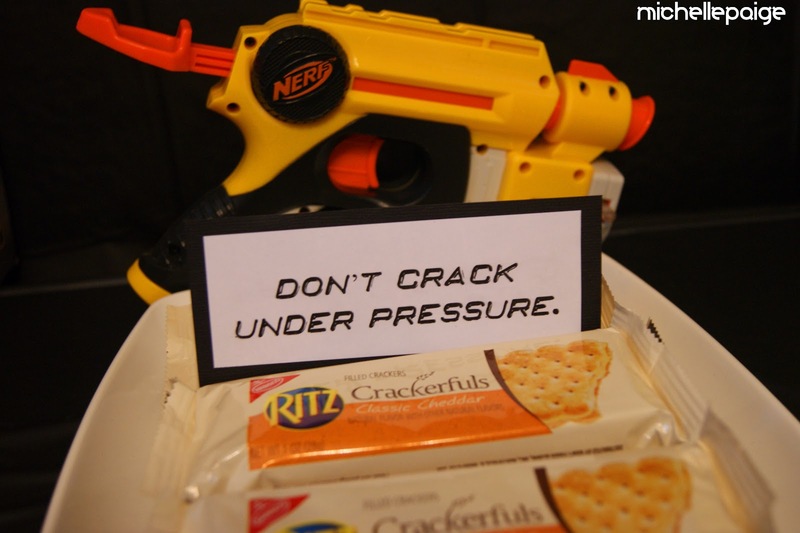 A friend of mine recently saw your page and decided to have a Nerf Party for her 7yr old son. I then created this Nerf Party invitation for her. 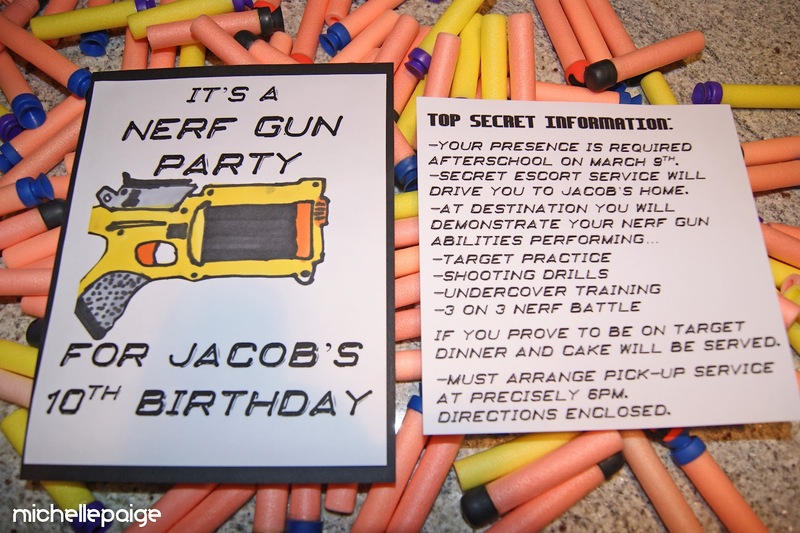 I wanted to let you know every time I've made a sale on my Nerf Party Invitation design ( https://www.etsy.com/listing/112324167/diy-nerf-boy-party-invitation-self-print ), I always link to your page because it is such a amazing example of a Nerf party. They always tell me they got some great ideas from you. What a great idea! I love those party supplies and cake decoration. Great (easy) ideas!! I'm putting together a Nerf party for my soon-to-be 8 yr old son & this helps a lot! My god this is so awesome, I'm a grown man and I would love to have this for my own birthday party. Dear Michelle I loved your idea's! Really awesome! I loved your font. Would you mind share the font's name with me? Regards form the Netherlands Antilles! Hi, love the cake! 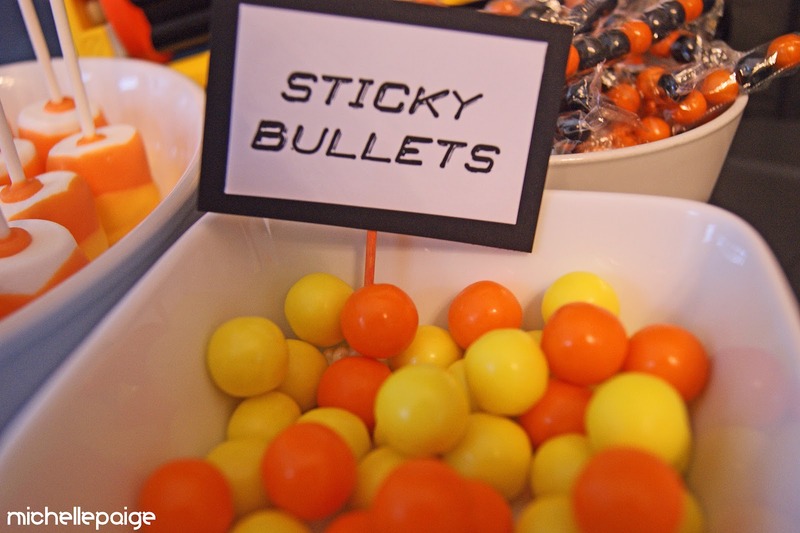 Are those edible bullets and if so where and how did you make them? Thanks! 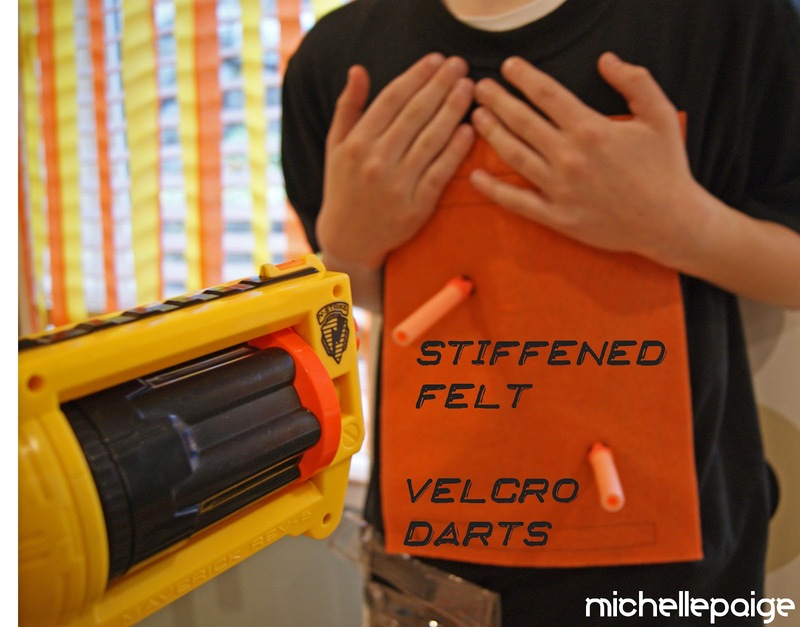 Great idea- I am borrowing some ideas from it but have a question- which nerf gun did you buy that was able to use both the Velcro darts and the suction darts? thanks!! 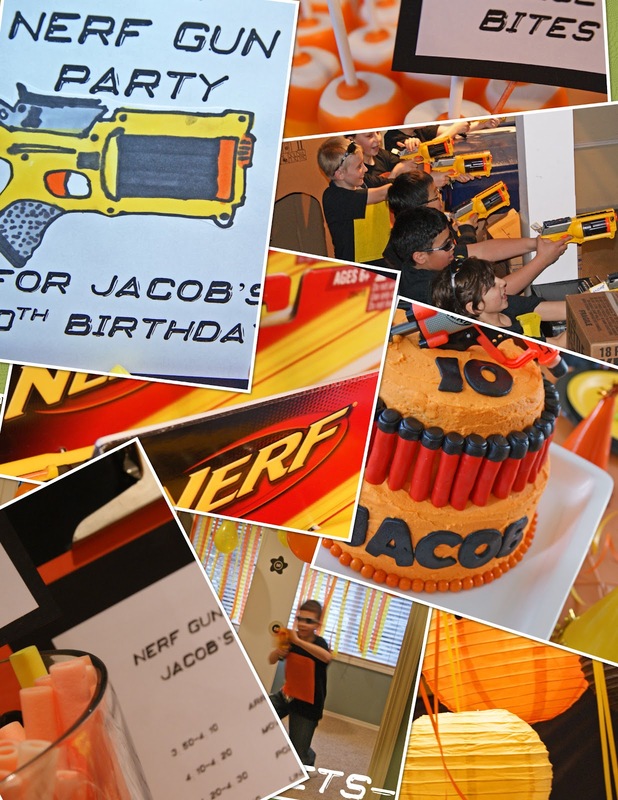 I am having a Nerf Capture the Flag party for my son's 10th birthday this month and your ideas are going to be the icing on the cake!!!! Thanks for sharing! AWESOME IDEA, SAVED MONEY BEING CREATIVE. BY THE WAY, I LOVE THE CAKE!! I printed out the picture of the cake and asked him if he liked it and his response was, 'I love it!!!' He's turning 9 this month so your party idea was helpful. Thanks for sharing. I didn't realize that a target shooting can be a good idea for children's birthday until I read this blog maybe it can also work for adult. Your idea is so good and give me idea how will my birthday be creative and adventurous. I am hoping that my son's 6th birthday party will be as nicely executed as yours. Your post has inspired me to make my Nerf party personalized and witty. For personalization, I handmade a "target" piñata. 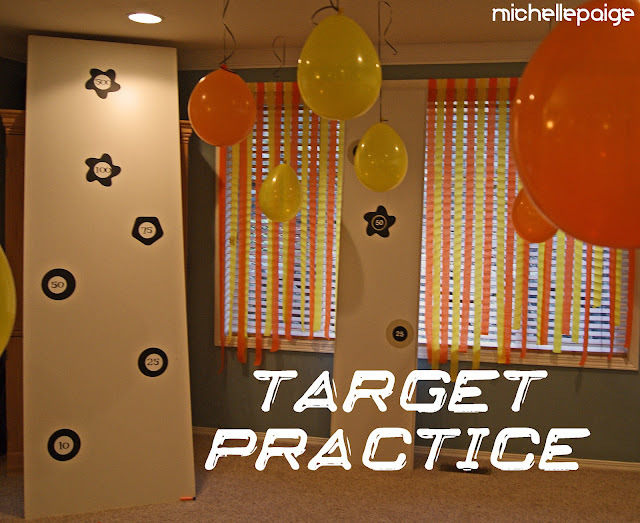 For future Nerf party planners, consider making your own piñata. It really is simple and cheap! I blogged about how to make the piñata in hopes that I would inspire others as you do. Thank you for such an informative post!! Looks like fun. Might do this for my son's 13th birthday so I'm pinning this idea. Thanks. 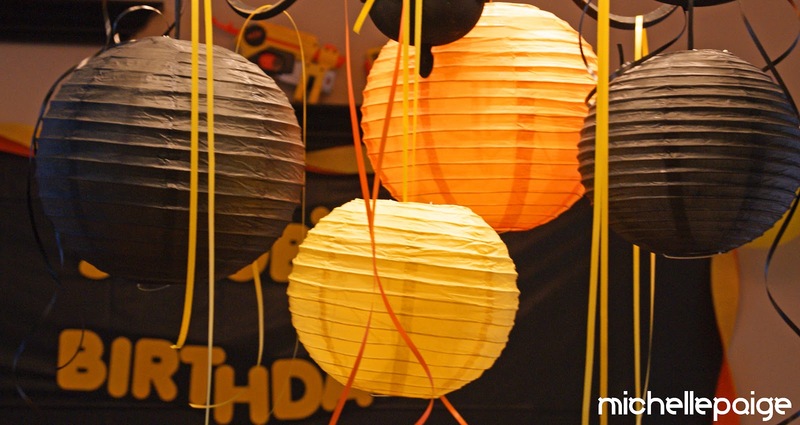 My kid is turning 8 soon and these ideas will certainly help.